Columbus sailed the ocean blue in 1492. On Oct. 12, 517 years later, banks are closed and there's no mail. And despite being a federal holiday, for most in the U.S. it's another day at the office. Observed on the second Monday in October, the holiday celebrates the achievements of Christopher Columbus, a man who lived almost three centuries before the U.S. Federal Government even existed, much less created a holiday in his honor. But for such a loosely observed federal holiday, Columbus Day generates no small amount of controversy: the day, like the man himself, is reviled by critics who feel Columbus' arrival in the New World opened the doors to hundreds of years of exploitation and genocide. Is it really worth it? Many Italian Americans in particular think so. Columbus Day has its roots in cultural pride, a celebration of the Italian explorer's "discovery" of the Americas when he landed on a Caribbean island in what's now the Bahamas on Oct. 12, 1492. 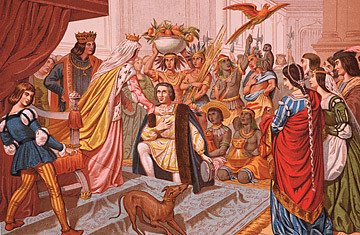 The 300-year anniversary of Columbus' landing prompted the first recorded celebration of the achievement, in New York City in 1792. On the 400th anniversary, President Benjamin Harrison issued the first official proclamation urging Americans to celebrate the day. It led the Knights of Columbus, an organization with a largely Italian, Roman Catholic membership, to lobby heavily for states and the Federal Government to make Columbus Day official. Franklin Roosevelt created the first federal observance of Columbus Day in 1937; Richard Nixon established the modern holiday by presidential proclamation in 1972. New York City continues to show Columbus Day pride  the city holds the largest parade for it in the country. But these public shows of support draw frequent protests from Native Americans, who make the point that Columbus discovered nothing  indigenous populations were living in the Americas long before European explorers made their first tentative trips across the Atlantic. And once here, Columbus wasn't exactly kind to his new neighbors. Indeed, on his very first day in the New World, Columbus took six natives as slaves. He'd go on to press thousands more into forced labor, killing dissenters. Even his own colonists didn't like him  complaints led him to be called back by his Spanish royal sponsors in 1500. All that casts a bit of a pall over celebrations of the man's achievements  a pall that has extended to the holiday itself. While Colorado became the first state to set aside a day in Columbus' honor, in 1907, in recent years Denver's parade has been disrupted by angry protesters. This year an unknown hoaxster notified the media (falsely) that this year's parade was canceled. But organizers are undeterred, telling the Wall Street Journal that "the parade will not be stopped." And neither will Columbus Day itself, at least not anytime soon. While there have been some efforts to get its federal-holiday status revoked, many seem content to simply ignore the holiday entirely. The two exceptions are retailers, for whom Columbus Day is the first big sales opportunity after August's back-to-school rush, and those who have repurposed the holiday into something less problematic (South Dakotans, for example, celebrate Native Americans Day instead). But relax, weary workers. Thanksgiving's little more than a month away, and that, at least, is a federal holiday most of us can agree is worthy of a day off.